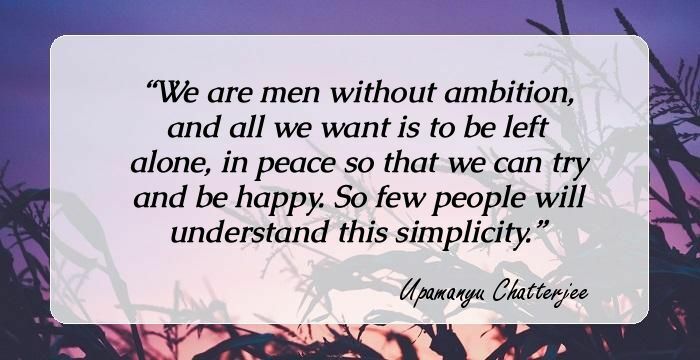 14 Inspiring Quotes By Upamanyu Chatterjee That Will Compel You To Pursue Your Interests With Renewed Zeal. One look at Upamanyu Chaterjee in his office of Joint Secretary to GOI on the Petroleum and Natural Gas Regulatory Board and you cannot possibly fathom that the man possess a streak of literary genius. However, the beauracrat has a string of critically acclaimed and successful novels to his credit. He made his debut with 'English, August' which is regarded as one of the coming-of-age stories regarding modern India. Agastya Sen, the novel's protagonist presented a view of India which the world was unaware of. The character seems timeless and still feels fresh. Known for his sense of self-depreciating humor Upamanyu believes he dabbles with his multiple personalities —the government officer and writer—with ease. Speaking about his peers who fail to pursue their creative interests, he says, "It's a pity when bureaucrats say they like to paint or write but don't have the time." His latest book 'Fairy Tales at Fifty’ is another dark comedy, with Buddhism at its center. Here are a few inspiring quotes by the famous novelist that will give new wings to the hidden writer in you. We are men without ambition, and all we want is to be left alone, in peace so that we can try and be happy. So few people will understand this simplicity. 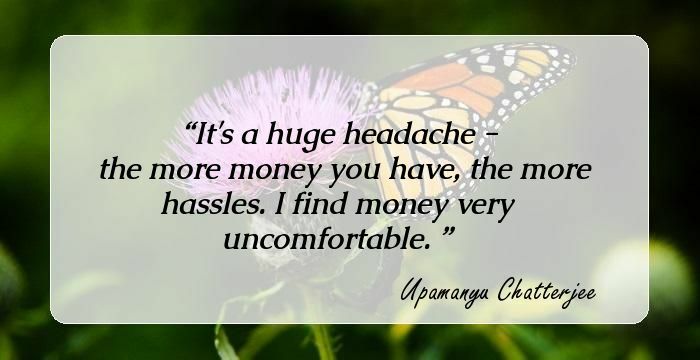 It's a huge headache - the more money you have, the more hassles. I find money very uncomfortable. 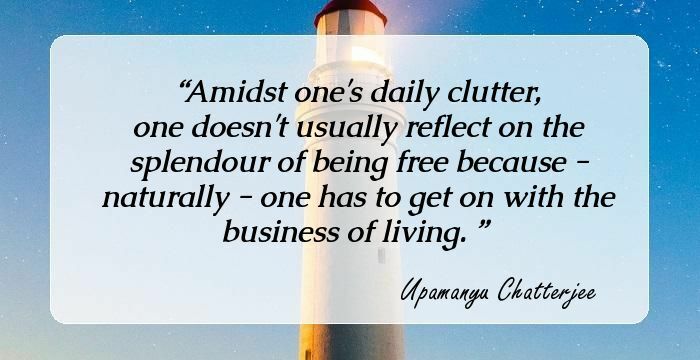 Amidst one's daily clutter, one doesn't usually reflect on the splendour of being free because - naturally - one has to get on with the business of living. Anyone who has grown up in Delhi knows it's horrible. I need to have some depth in my characters. That's why they are all Bengalis. I can't imagine writing a book with someone called Saxena as the hero. The more languages you know, the less likely you are to become a terrorist. I feel completely at home in the absurdities of India. Well, life is dark, isn't it? Mostly, it's dreadful. At the same time, death is funny too. I mean, look at the fuss we make of it. For me, comedy is richer and larger than anything else. I don't think I would do better books if I wrote full time. I write for amateurish reasons. So much better to write pen on paper; you can do it anywhere, say, while stuck at the airport. No one reveals himself more completely to others than to himself - that is, if he reveals himself at all. Only when you die will you cease to feel ridiculous.